The naked policeman who was the first Olympic walking champion. George Larner did not take up competitive walking until 1903 when he was 28-years old. In 1904, when still little more than a novice, he won both AAA titles, and he repeated the double the following year. Having won four AAA titles and set nine world records, Larner then decided to retire as he found that training interfered with his duties as a Brighton policeman. 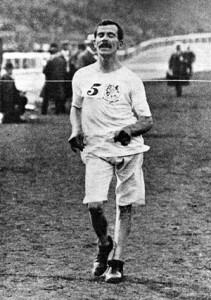 Fortunately, the Chief Constable of Brighton was persuaded to give Larner time off from work to train for the 1908 Olympic Games, and after a two-year absence, Larner reappeared on the track. Although he had an exceptionally long stride, Larner was generally rated as a very fair stylist and it came as no surprise when he was disqualified in his first comeback race, the AAA 7 mile Championship in April 1908. He soon redeemed himself by winning the AAA 2 mile title in July and then won both the Olympic walking titles later than month. After the Games, Larner retired again from race walking but he enjoyed some modest successes as a cross-country runner with Brighton & County Harriers and Highgate Harriers. In 1911 he made another comeback and won the AAA 7 miles title, but he did not stay in training for the 1912 Olympics. After he finally tired, George Larner became a respected race walking judge and when he died, at the age of 73, many of his British records were still intact. He published a book, simply titled “Walking”, in which he gave the following advice – “When time permits, all clothing should be removed for a run round a secluded garden, especially it if be raining at the time”. Personal Bests: Mile Walk – 6:26.0 (1904); 2 miles Walk – 13:11.4 (1904); 3 miles Walk – 20:25.8 (1905); 10kmW – 44:58.4e (1905); 7 miles Walk – 50:50.8 (1905); 10 miles Walk – 1-15:57.4 (1908); Hour Walk – 13,275 metres (8 miles, 438 yards) (1905).